In which G.M. Norton fills his pockets with UK-made goodness. 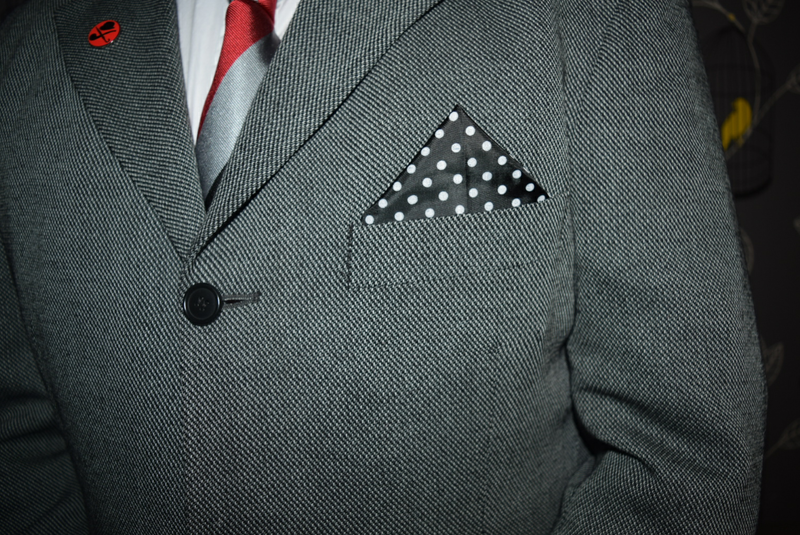 Over the last few years, the pocket square has made a triumphant return to the breast pockets of men across the land. I love a pocket square, simply because they add a fancy flourish to an outfit. Of course, they are merely decorative. Originally, pocket squares (or handkerchiefs as they are also referred) were always carried to mop one's brow or to offer to a lady in need. Recently, I made the acquaintance of a brand new pocket square enterprise, by the name of Squared Pocket. They are based right here in Blighty, in Leeds to be precise, and pleasingly, their pocket squares are all made in the UK. What's more, chumrades, they are very affordable too at a penny under the ten English pounds mark. Keen to add to a burgeoning pocket square collection, I'm forever on the hunt for affordable pieces and Squared Pocket fit the bill. They have a growing collection available on their webular site, sized at 10" by 10". For the purpose of this review, I was very generously sent three of their pocket squares. The first one I opted for, 'The Kingston', may be quite surprising as it is made of (shock, horror) polyester. I avoid polyester usually, preferring natural materials such as wool, silk and cotton. I was intrigued by a polyester pocket square though and have always had a soft spot for polka dots so I was keen to test it out. And you know what? I rather like it. Yes, its not a fine silk but it's easy to fold into a pointed triangle and the contrast between black and white is jolly pleasing. Worn with a silk New Sheridan Club tie, grey wool jacket and a white cotton shirt with detachable collar, a little polyester can be forgiven. Next up is a gingham number called 'The York'. This pocket square is cotton which unlike silk, can be taken out for a spin in the washing machine. This is good news should you miss your mouth as you're tucking into your morning breakfast of devilled kidneys. Gingham hails from my home city of Manchester, so it has a place close to my heart. I decided to pair the black and white gingham with a navy blazer, which is one of the most versatile items one can own. I thought it looked just the ticket when adding a pink regimental style neck tie. 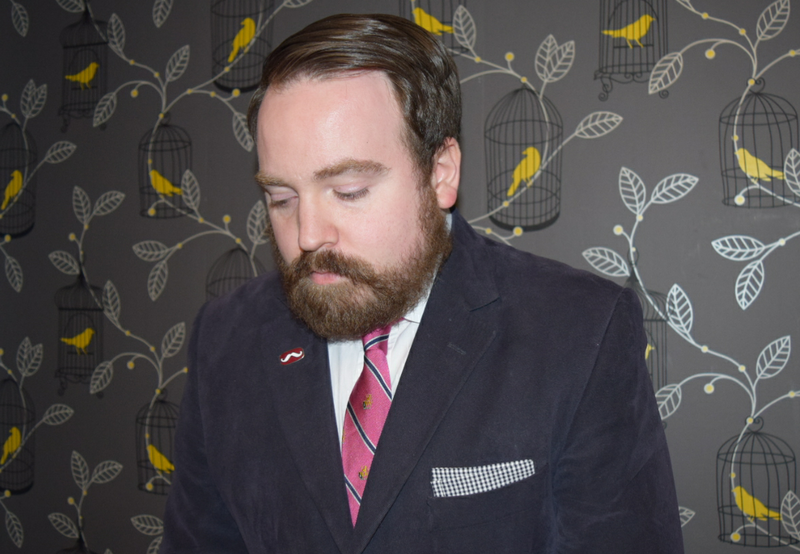 The third and final pocket square is 'The Stirling', a super red tartan pocket square made from cotton. I can't help feeling this ensemble has something of the Eleventh Doctor about it, when paired with a dicky bow and tweed jacket. This was my first ever tweed purchase, I might add. One never forgets their first foray into tweed. Despite having no known Scottish heritage, my love of tartan holds no bounds. I prefer a casual stuffing, especially with tweed so no carefully folded pocket square style this time. Tartan, paisley, tweed and tattersall make my heart aflutter. Polka dots, gingham and tartan are classics and perfect additions to a gentleman's wardrobe. I'll be keeping a watchful eye over Squared Pocket. I must confess, I'm rather taken with their pink linen 'The Lincoln' pocket square too. Do take a look at their wares and support a new sartorial enterprise.